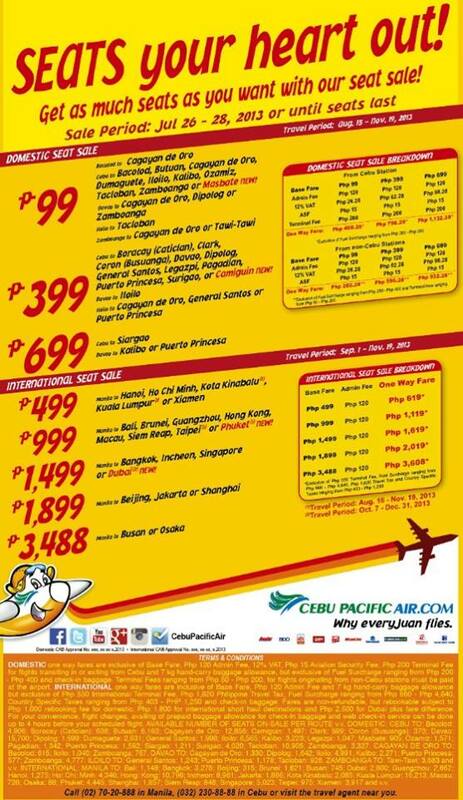 Cebu Pacific Promo: SEATS Your Heart Out! Promo base fare starts at P99 as the lowest. You can go anywhere in the Philippines. Check the photo above. Lowest base fare is at P499. So feel free to visit Xiamen, Ho Chi Minh, Kuala Lumpur and etc. Get as many seats as you want with our latest ‪#‎CEBseatsale‬! Log on to http://www.cebupacificair.com/ to book your flight now!